If you have deferred payment on items through your rural supplier, there are three areas to look for on the statement, once it's been imported into Cash Manager Focus. Below is an example of a Farm Source statement. The items that have been deferred indicated by a $0.00 value. The same deferred items, with a dollar value. Have a look at the instructions below, which walk you through how to code and balance a statement with deferred expenses. Remember: check with your accountant regarding when the GST can be claimed. Locate the invoice line that refers to 'This month not yet due' or similar. The amount will be displayed as income to balance the invoice back to the total amount due for the month. Code this line to DF (Deferred Expenses). GST type is Exempt (you're claiming GST in the invoice lines that relate to the items themselves). Locate the deferred items that have a dollar value (refer to #3 in the image above). 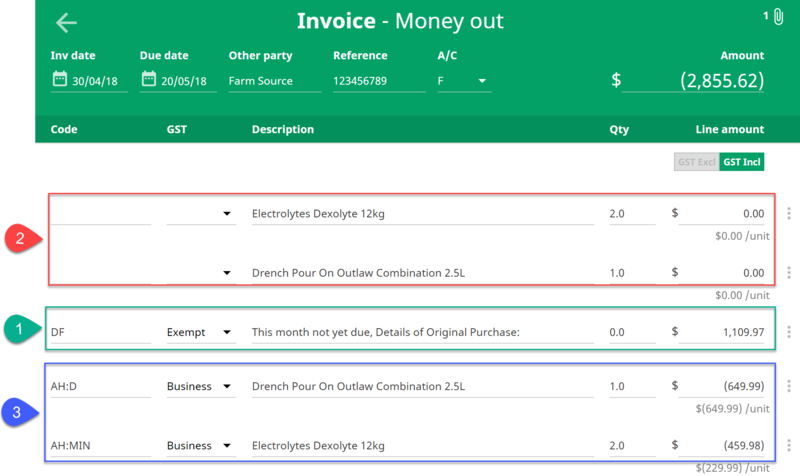 Allocate codes that are relevant to the item in the invoice line i.e. AH:D for drench. Locate the $0.00 lines that refer to the same items and delete them. What happens when you pay for the deferred items? Code future payments relating to the deferred items to DF (Deferred Expenses). The outstanding balance against this code will decrease so that when the final payment is made, the DF code will have a $0.00 balance.